As I wrote in my book „On Cheesemaking“ (well, so far only in German, Vom Käsemachen, but yes, a perfect Christmas present! ), I think of cheese as a wonderful guiding star. The ever-growing group of Heinzelcheesetalkers can vouch for the fact that it has taken me to amazing corners of this world and return with the most wonderful cheeses and memories. Obviously I sometimes also head out with a certain producer or region in mind. But the most impressive findings are those serendipity has her saying in (remember the Camembert from Vietnam?!). As was the case with this cheese, made from goats milk, by Canan Urhan, in İzmir. My friend Gamze, food scout extraordinaire, had invited me to attend a gastrofestival. The city on the seashore reminded me of Thessaloniki, on the opposite side of the Egean, the weather was wonderful, everybody seemed to be in a good mood. 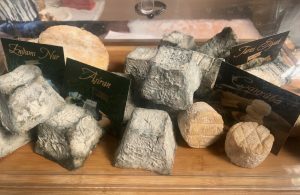 And yet, I was nervous, because I had agreed – without really thinking about it – to moderate a Heinzelcheesetalk with regional wines and cheese. How many wines from this old wine region (İzmir once went under the name of Smyrna!) was I really familiar with? How many cheeses had I tasted? Embarrassingly few… on top of that came the usual clash between my Prussian preference for longterm planning and Anatolian last minute improvisation. But in the end it’s always been a happy ending, and İzmir made no exception. 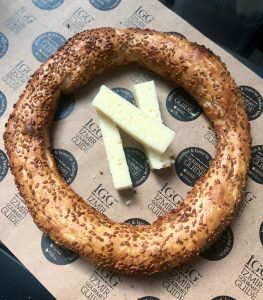 Not only came I across an exceptional local tulum cheese (at a stall serving it with gevrek, as the e circular sesame bread otherwise known as simit is called here), I also met Canan Urhan, who had brought her Miralem goat cheeses. At first glance, in spite of their Turkish names – Aşiran, Canrüba, Endamı Nur and Tarzı Siyah – they looked like copies of French classics. But then I started tasting and was surprised about and much impressed by their very special texture. They were solid and dense, but not dry, melting in the mouth like some compact (but obviously not cold) ice-cream, with a compelling acidity. Canan told me how in 2005 she had visited her son who back then studied in the south of France and found a new friend in a French cheesemaker. 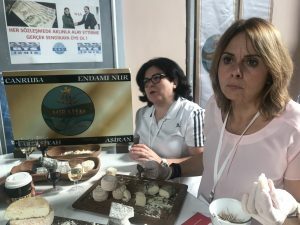 One thing led to another until Canan, who so far had had no entrepreneurial ambitions, started to make cheese back home in İzmir, from purchased goats milk, based on French methods. 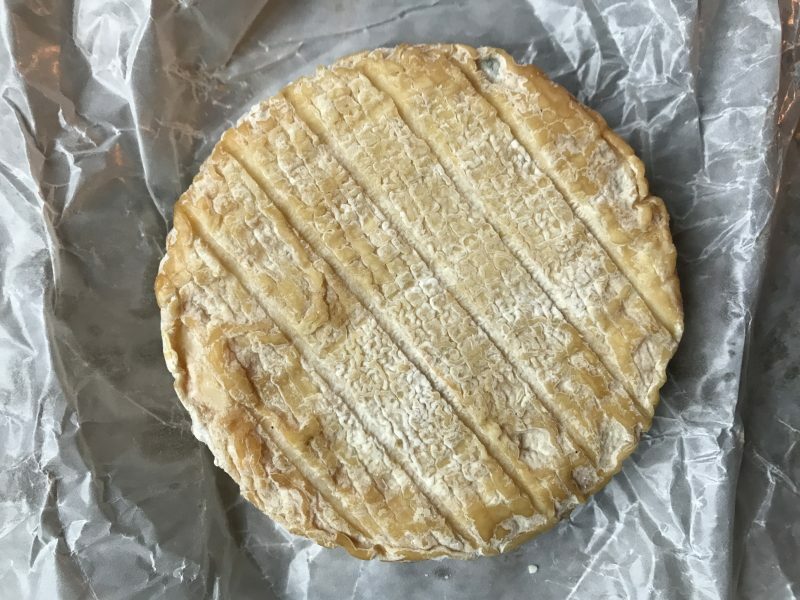 The lively woman in her mid-fifties showed me four different cheeses, all of them small lactic ones using very small amounts of rennet and ripening with yeasts, bacteria and moulds. Canrüba looked like a crottin, Tarzı Siyah came in the shape of a small log, Aşiran was a flat pyramid, both of the last covered in ash. And then: Endamı Nur. A relatively large disc for this kind of cheese, with a touch of orange brevibacterium linens under some white mould. Hard. And yet melting. But also crumbly… why was I suddenly back in Erzincan, thinking of that region’s tulum cheeses? Because this was a very similar mouthfeel, albeit matured faster and without a goatskin, very different and yet related. Understandably. Because this is, even more so then the rest of the Miralem offerings, a completely original, made using classic French methods while referencing the ancient tulum cheese culture. It was three weeks old when I first encountered it in İzmir, and it paired beautifully with the quite powerful red wines from Urla, Urlice and Lucien Arkas. Now, five, almost six weeks later it smiles at me in wintery Berlin, tasting a bit more assertive but by no means sharp – and I think tonight I might open a bottle of Ökügözü to honour Canan, my new cheese friend and the ever guiding star.